What's your screen brightness set to? I use the pre-set options in Battery Widget Reborn. Indoors, I'm at 10% and outdoors at 25%. .
Auto. Stupid to use anything else. 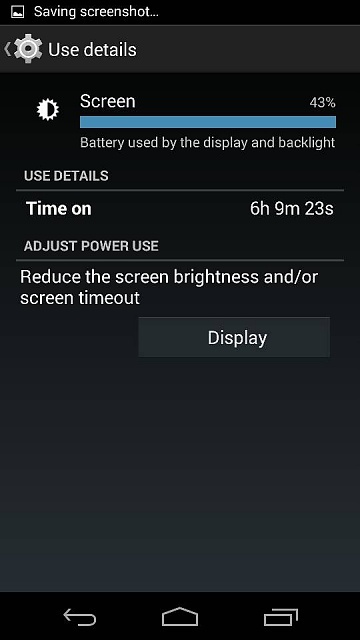 For battery life imposes auto is not ideal. I keep mine set anywhere between 40-50%. Most of my time is spent indoors, so it's not a problem at that level. When I'm outside I'll set it higher depending on conditions. I use manual brightness and like to keep it fairly low. I set a long press of the back button to show the brightness slider for ease of use. Auto Brightness uses too much battery, I use 25 indoors and 50 outside on a bright day and 10 if laying in bed in the dark. maybe this isnt the best place to ask this, but im thinking of getting the nexus 6, assuming its the 5.9 beast its rumored to be. I have a note 3 right now, and one thing I happen to like is having the brightness slider in the drop down menu. is there some sort of short cut, or app I should know about to enable me to mess with the brightness easily? my eyes are sensitive, and depending on light conditions, im constantly changing the brightness. That's not currently part of stock Android. However, during my brief time with Android L, I seem to recall brightness was in the dropdown. Can anyone confirm? I go back and forth between auto and 100%. Are you me? This is exactly what I do using notification toggle with values set at 10, 25, 50, 100. Are you stock? 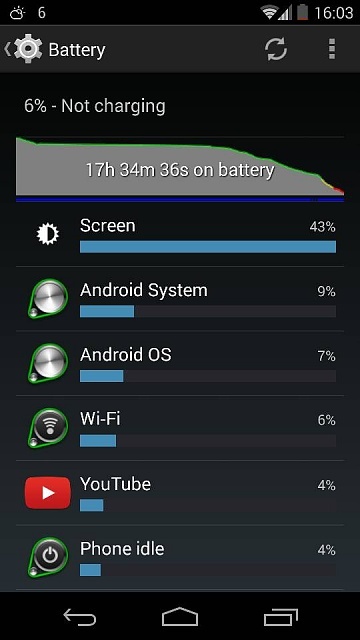 How are you getting screen on time like that? Completely stock. All I did was keep the brightness turned all the way down. Should I reset my phone back to factory settings if my soft keys don't work? How can I get my computer to recognize my lgg2 in order to transfer pics to a computer? What is the REAL size of an Galaxy Tab 2 10.1 in Landscape?